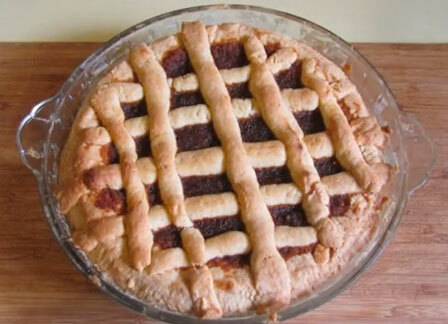 This week’s recipe is a very special treacle tart made using my Mum’s pastry recipe. It’s not quite traditional so I also tell you the changes needed to make it in the completely traditional way in the video below. 500gm or 1lb 1 1/2oz self raising flour. Use plain flour for a more traditional shortcrust pastry. 250gm or 8 3/4 oz of butter or cooking margarine. 2 eggs mixed with a little water. 1/2 cup of white sugar. Rub sugar (or salt), flour and margarine together until it feels like bread-crumbs. Add egg water and mix gently until combined. Rest in the fridge for half an hour. The pastry, not you. Roll out and cut a circle to fit an 8″ or 20 cm pie tin. Grease and flour your pie tin and lay the pastry base in it. Line the top of the pastry shell with baking paper and weight down with rice or pie weights and bake for 15 minutes. Combine the bread crumbs and treacle and pour into the baked pie crust. Bake for 30 – 35 minutes or until the pastry is golden brown. Serve with custard or whipped cream. 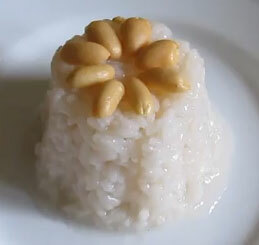 An unusual and sweet 19th century rice pudding dessert. 135gm or 4 1/2oz of sticky rice. I have used medium grain rice. Put the rice, water, sugar and cinnamon in a saucepan and cook over a gentle heat until all of the water has been absorbed. Turn off the heat, put on a close fitting lid and leave to cool. Rinse some small jell-o (jelly to my non-US viewers) moulds out with water and leave them wet. Press the rice into the moulds. Put them in the fridge to set completely. Put a plate on top of the moud, flip upside down and remove the mould.